Baby Chick Crumbs is an ideal feed from hatching through to 6-8 weeks. To help a smooth change over to Poultry Grower Pellets, we recommend mixing the two feeds from 5-6 weeks. 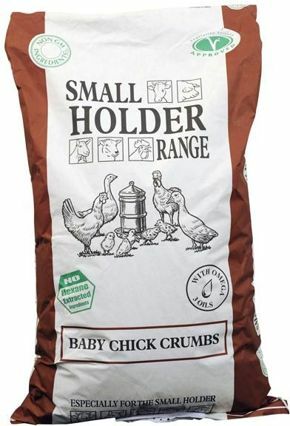 •If feeding QUAIL, GAME or TURKEY CHICKS please use Smallholder Turkey Starter crumbs. •The Lysine and Methionine in this feed are from natural sources – synthetic amino acids are not used in this feed. •This feed is drug free and does not contain Coccidiostats. •Smallholder Range only source identity preserved (Hard IP) Non-GM ingredients. •Smallholder Range feeds are made from natural ingredients which can result in the feed changing colour slightly through the seasons. Feed ad lib from hatching until 4-8 weeks before gradually changing over to Poultry Grower Pellets. This feed should be fed with ad lib fresh water. Do not feed to quail, game or turkey chicks as higher protein levels are needed.